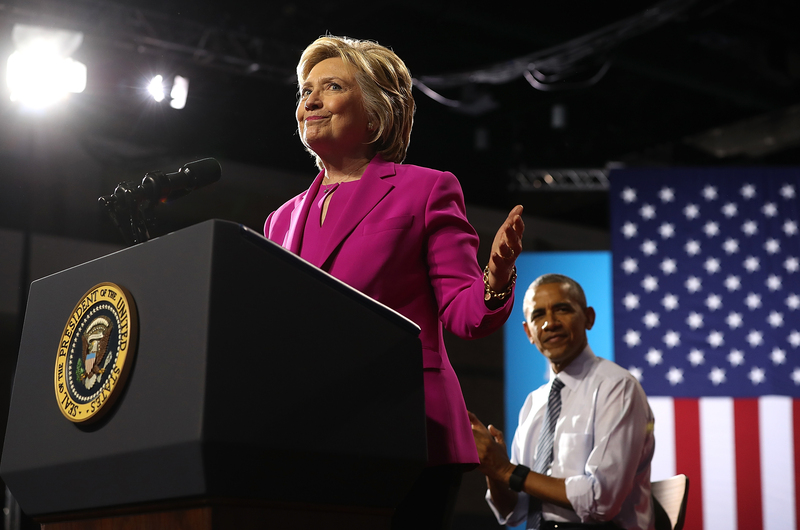 Presumptive Democratic nominee Hillary Clinton and President Obama were campaigning together on Tuesday afternoon at the Charlotte Convention Center in Charlotte, North Carolina. The pair showed up together on Air Force One soon after FBI Director James Comey announced the decision against indicting the presidential nominee in an investigation of her emails, though not without critiques of his own. And so, at the North Carolina rally Obama appears thoughtful in this meme, and we want to know what he's thinking about — perhaps it was Comey's announcement on Tuesday. During Tuesday's event, Clinton talked about her run against Obama in 2008, and how their relationship has developed over the years "from political rivals to partners to friends." So perhaps Obama was giving some thought to their friendship. Clinton spoke of Obama's character and said, "I also know him as the friend that I was honored to stand with in the good times and the hard times. Someone who has never forgotten where he came from." Perhaps Obama was thinking about where Hillary might go with that thought; it's still risky to talk about where Obama came from when so many people might take to Twitter to question whether his birth certificate is real. But, Clinton continued, "Donald, if you are out there tweeting, it is Hawaii." Good save! Of course, as President of the United States, there are plenty of things that Obama could be thinking about — even average everyday American thoughts. It's probably safe to say Obama didn't leave the oven on. How much time does he have to spend in the kitchen anyway? And if he did leave it on, surely someone on staff would be around to save the day so that Obama doesn't have to take a quick Air Force One trip back home mid-rally. Maybe the president was thinking about what this election means for the country and for the world. He told the crowd how he believes in Clinton moving forward, and spoke to the real-life consequences of her opponent's violent rhetoric. Obama said, "This is not a reality show, this is reality. You don’t have the luxury of just saying whatever pops into your head." And he's right. We cannot treat this election as American entertainment. We cannot continue to brush off GOP nominee Donald Trump as the unlikely next president of the United States. And for the many people across the country whose lives will be most affected by a Trump presidency — black Americans and other people of color, women, the Muslim community, immigrants, and so many more — there is so much at stake. Perhaps this is what Obama was thinking about.